in vicious cycles of unhealthy thought patterns, emotions or behaviours? Maybe Cognitive Behavioural Therapy can help. Cognitive Behavioural Therapy, often referred to as CBT, focuses on working collaboratively with a therapist to discover negative patterns of thinking in response to situations. These negative thoughts in turn create emotions. The end result of these maladaptive or irrational thoughts and triggered emotions are behaviours. Situation: A good friend suddenly cancels a pre-arranged dinner date. Automatic Thoughts: She must be mad at me. What did I do wrong? Behaviour: Doesn’t return future phone calls from friend. While the above example appears to be quite simplistic, how we interpret situations can ultimately establish a person’s core values and develop the context in which we view ourselves and others. The goal of CBT is to discover the link between how we interpret and process situations, how we feel and how we behave. Developing an awareness of our automatic thoughts as well as the impact our thinking has on our mood and behaviour can lead to important behavioural changes. It is very possible to develop new, more productive ways of thinking and processing situations. CBT is both time limited and structured. There is work involved so it requires motivation and action on the client’s part. 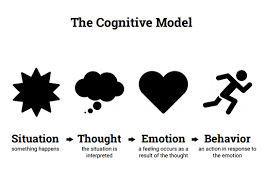 Cognitive Behavioural Therapy focuses on the “Here and Now”. CBT can be extremely beneficial in treating mood disorders, depression, low-self- esteem, as well as anxiety disorders. This entry was posted in Cognitive Behavioural Therap7y. Bookmark the permalink.